As of this post, the blog is on hiatus until further notice, because I can't do this anymore. I'm tired of sitting down every week to talk about what's not working. I'm tired of talking about things I've learned that I should have figured out years ago, especially when I'm almost certain I've talked about learning that before. I'm tired of finding new ways to say that another would-have-been story didn't work out. This thing has become a weekly reminder of everything that's gone wrong with my attempt at a writing career, and I don't need that. It feels like there's no point in talking about how things are going for me anymore. Simply put, I'm in the worst place I've ever been. Everything I come up with dies - I can't figure out how my plots are supposed to go, my attempts at character creation are shallow and empty, and my world-building is barely there. I don't get excited at working with new ideas, and looking back at old ones seems pointless. It feels like something broke in me. I don't know how to get back to how I used to be, or how to push through it to get to where I can make things work again. Before anyone asks, no, I'm not giving up writing. I'm still trying, if "sitting in front of my computer unable to force myself to even open up my word processor" counts as trying. But I don't want to talk about it anymore. Anyway. Thanks to those of you who've stuck with me through this thing. I'm truly grateful for your encouragement and support over the years. I don't know if I'll pick this up again, but if I do, I'll post it on Twitter as per usual. I'll keep reading everyone's blogs when I can; I know y'all are working hard at this and I want to see you succeed. A Slight Hitch in the Process. This is not what I'd planned to be working on right now. I'd planned to work on Project K, to take it from a handful of pages in my idea file and put it into an actual plotting document, so I could work on turning it into a full story. But right now, I can't bring myself to do it. Because it feels like my plotting documents are where my stories go to die. I've talked about some of this before. Part of my process is scribbling down things in my idea file, and adding more and more to that as I come up with it. But I can't do all my work in that one file - the thing's up to nearly eighty pages again, I have to take stuff out of it once in a while. Unfortunately, I've noticed a pattern over the past few years. Every single time I take my notes out of the idea file and give them a plotting file of their own, I'll keep working on that story for a little while, and then it falls apart. I've covered the multitude of reasons why this happens over the past few years, because that's what's happened every single time, and I don't need to go over them yet again. But it keeps happening. I've talked about this with my therapist, as it's something that's troubled me ever since I realized it. It feels like there's something about giving a story its own file that creates some kind of commitment to it - it stops being just an idea, and becomes something I'm going to dedicate time and energy to making it become an actual book. And that's when the problems start. I lose interest, or I find something wrong with the original concept and try to rework it, or any number of other things that I just said I wasn't going to talk about again. The end result is the same. This has already happened to Project H, which is the one that brought me out of my long writing funk in the first place. I've completely redone the second act and changed a huge chunk of the story's setting in doing so; the new stuff works better but I haven't felt like touching the story since I did that. And I've already done some major revisions on Project K to begin with - this past weekend, I made some changes to the setting that work really well but mean I have to rethink a lot of things about the story. So when I sat down to put Project K into its own file, I couldn't make myself do it. Because I really like this story, and I don't want to see it die. I know it's possible (maybe even likely) that I'm thinking on this too hard, as per usual. The fact that I have an idea file that's more than seventy pages long means that I have a lot of things I've written down and not done any more work on. And my main writing folder is filled with things that didn't work out, that's nothing new. But this consistent pattern of creating story files and then having them crash and burn... it scares the hell out of me. What the hell am I supposed to do? The person is what's important, not the thing they're doing. I've got a project I've been working on that's going reasonably well. Let's call it Project H, for reasons that would take too long to explain. Project H started with one single image - a person of a fantasy race doing something people of that race don't usually do. Something about it struck me, and I knew I wanted to tell her story. When I started developing the idea, everything came from that image, and it all led toward the main character doing what she needed to do. Everything I created was for a world where this character could do the forbidden thing that started her story. But if I'd decided to develop the world in general terms, without knowing who she was, what she was going to do, and why it was forbidden, I would have come up with something completely different. And odds are good it wouldn't have worked. This feels like something elementary. And yet, if I'd realized this months ago, I probably could have saved myself a lot of heartache. I like world-building, kind of a lot. Part of the fun of developing STARWIND was coming up with all the different places the crew would go and what those places were like, what had happened to make them what they were. But I also know that a lot of the trouble I've been having over the past two years stems from not being able to find the story - from having a whole lot of 'where' and 'what', and nowhere near enough 'who'. Hell, I have a fifty-something page document that's full of seven different attempts to rework a world that's based around what I thought was a great concept. Only one or two of those attempts has an actual story anywhere in it. Because I couldn't create a world worth writing in without anyone to live there. I have something else I'm working on - let's call it Project K, to prevent confusion - which is the first thing I've done since I realized this. (I didn't realize it all that long ago.) There's also all kinds of weird world stuff to do with this one, and to make things even stranger, it's a world that has nothing to do with the main character. But a lot of the design I've been doing has one goal in mind: what do these places need to be to serve the main character's story? And I'm pleased to say one thing about Project K: so far, so good. If I have to keep learning stuff that feels like I should have learned long ago, at least I can do it right. I think it's safe to say that everyone reading this knows the concept of the "shiny new idea". It's something that happens to we writers when we're supposed to be working on something else and we get this idea out of nowhere that's just so cool. I know this as well as anyone. My idea file is seventy-something pages' worth of ideas that once were new with varying levels of shininess. Most if not all of the blogs I read have had entries about this. It's one of the things that all writers, regardless of genre or book length or whatever else, seem to share. And yet, it's something we complain about. The visual we share of having a shiny new idea tends to be something like the dog from "Up" - it's like we're diligently working on whatever we're supposed to be doing, and then suddenly SQUIRREL! as the new idea appears. I thought about this for a while, about why it's such a common perception for having a new idea, and I realized what the problem is. It's not the new idea that's the problem. It's calling it "shiny", like it's some pointless distraction that only serves to take our attention away from what we need to do. We act like we've got some sort of pseudo-ADD thing going on, that we can't help but be distracted by something we want to write right now. But that's not what it is. Everything we do comes from new ideas. So why do we mock ourselves for having them? As you might have noticed if you've been reading this blog for a while, I have a serious tendency to be self-deprecating. My therapist calls me out for doing this, and my usual response is "But I'm really good at it!" But as she's told me many times, the way we talk about ourselves and what we do affects us a lot. What we call things affects how we see them and how we feel about them. And by mocking our own new ideas as "shiny", we're giving ourselves a negative association with something we writers need. So here's my bit of advice: don't call it the shiny new idea. Call it the lovely new idea. Same number of syllables, even scans the same if you want to write a poem about it, but using nothing but positive words for something that really should be a good thing. Enjoy your lovely new idea. Write it down. And when you have the time, show it the love it needs to grow into what you want it to be. Next week: it's the Person, not the Thing. About a month ago, I started off an entry saying I was going to ignore all that advice about not talking about what I was working on and tell everyone about a plot-in-progress. I now regret this, and I think it's time I changed how I approach this part of the process. To put it very kindly, I've been having trouble with my plots. To put it bluntly, I have not been able to take a single thing from concept to complete plot in a long, long time. I haven't finished a plot and gotten it ready to write since STARWIND, and that plot was two years in the making. And I wrote that book in 2016. It's been nearly two years since I was able to make anything work. The creative process is a long one, I know this. And a lot changes along the way. I've had plenty of ideas grow and twist as I worked on them, to the point that their origins were lost somewhere in their depths or excised completely as I discovered something new within the tale that worked better. It would be kind of depressing to go through this blog and look at all the plots I've talked about and see what did or didn't happen with them. But it wasn't until I realized that I was losing the Snow White story that I started to wonder if I should talk about my works-in-progress here. Oddly enough, it's because people actually said they wanted to read the thing that led to this. Shortly after I talked about the plot, I lost all enthusiasm for it; I've since realized why, but that's another entry. And I felt like I was letting people down. On one hand, I have a story that people want to read just from the basic concept. But on the other hand, I don't want to write that story, not the way I've plotted it. I could write it, but with what I have now, it would be crap. And I will not deliberately write crap. I don't have a good way to complete that metaphor, but I'd like to wait to talk about things until I've got the story to the point where I know what it's going to be. I don't think this will change much about the blog - probably more whining about things not working instead of talking about things that might work, but that's about it. So if things keep going the way they have, it's not like there will be much of a change. Anyway. That's all I've got for this week. Thanks as usual for listening to me ramble. I've actually had some reasonable success with recent ideas, which feels good. Wish me luck on making any of them work. Next week: IWSG - No More Shiny New Idea. The past week and a half has been pretty hellish, and I don't have anything to say this week that isn't more whining. >_< But I didn't want anyone to worry about me if I didn't post, so this is me saying I'm okay, just... weary. Weary and not much feeling like blogging this week. Hell, I couldn't even get around to everyone else's blogs last week, and I apologize for that. But I'm going to try to pull myself out of this and have something worth saying for my next entry. And hopefully get some good work done between now and then. Thank you all for the encouragement on last week's entry, and I'll see you next week. Kicked off the First Step. I have had the weirdest past few weeks when it comes to querying, but that's over now. 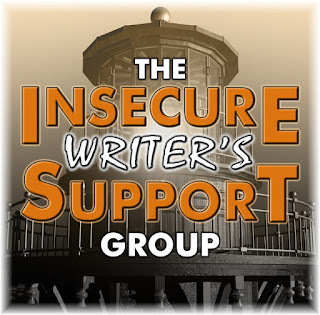 Back in September, I finally heard back from an agent who'd asked me to query her thanks to the July IWSG pitch contest. To my utter and complete shock, it was good news - the agent wanted my full manuscript. It took me a while to actually believe that this was happening to me, but I took care of everything and sent her what she wanted. Then, I accepted that I'd have to wait for a while, and when the answer came in December, it wasn't what I thought it would be. Querying has a whole lot of "it's not you, it's me" in it as agents tell us (or at least, tell me) over and over again that the writing business is very subjective and just because our work isn't right for them, we should keep trying because it could be right for someone else. I see this all the time, and now find it odd when a rejection letter doesn't include some variant of that. But when I heard back from this agent, I didn't actually hear back from this agent. On December 27th, I got an e-mail from another agent at the same agency, saying the original agent wasn't able to get to my submission due to their workload. But, this second agent said, they'd read my query and would like to see my manuscript. If you're getting emotional whiplash from any of this, imagine how I felt. :P It's one thing to hear "it's not you, it's me", quite another to hear "it's neither you nor me, it's my workload." After a significant amount of sputtering at how damn weird my life can get, I sent my book off to that agent as well, and settled in to play the waiting game again. I've heard that it can take 3-4 months to hear back from a full request, and I didn't get a response from the first one for three months, so I didn't think I'd get word from her anytime soon. I heard back from her on Monday. She said no. When this all started, and I was breathlessly telling people about it, I described the publishing process as like trying to climb a pyramid, and the higher you got, the lower the odds were of you getting any farther. After fifteen books and hundreds of rejections, this was my first full request ever. Technically my second one too. It felt like I had finally climbed onto that first step. And now, I've been kicked off, and find myself exactly where I was before. I'd love to say this makes no difference, because it's just another rejection, right? But it doesn't feel like that. It feels like one of those "why did I bother hoping" things. I know I should send more queries, but . . . I don't even want to. Having finally reached that first step, every time I don't get there is just going to feel worse. I swear, if I had any other story that was actually working and might become a book someday, I would have trunked STARWIND by now. But I've got nothing else. Blog is on hiatus until further notice. I don't know why you're reading this. Back From a Week at Sea.